Alexander Longochev, identified by the Libyan Captain of the tanker BADR as one of the guards of Bashev Team & Security, who hijacked the vessel on December 21, 2018, is an active employee of the Ministry of Interior since 2003. The Ministry is probing evidence made public by Bivol that he had been involved in the action against the ship qualified by the Libyan state as “piracy”. Moreover, the company “Bashev Team & Security” does not have a license for security activities, the Ministry of Interior says. No gun permits have been issued to its employees, the Ministry’s press office asserts in response to questions by Bivol. At the same time, the testimony of the Libyan Captain and crew is that armed men dressed in uniforms of that same security company have boarded the ship, threatened and abused the crew and the Captain and forced them to leave the vessel. They have acted together with border police officers and an employee of Maritime Administration. 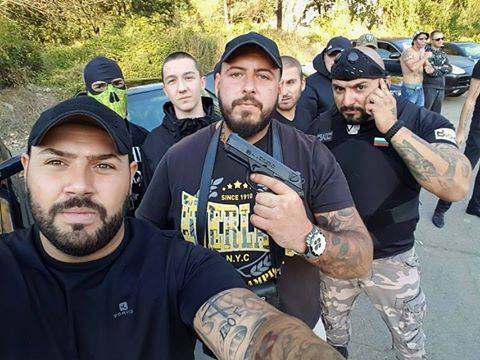 Despite the lack of a license, the guards of “Bashev Team & Security” openly brag on Facebook about their vehicles plastered with stickers with the logo of their illegal company, as well as about the guns for which they lack permits, such as the Glock gun, which one of the guards is photographed brandishing. “Bashev Team & Security” is associated with the thugs of Ivaylo “The Torino” Borisov, who rose to fame two years ago for beating innocent citizens on the Sofia beltway. It has been known since then that this gang had no licenses for a security firm. Rumen Bashev, for example, has been hired as a fitness instructor and nutrition counselor in one of Ivaylo Borisov’s companies, another of these men has worked as a driver, and so on. The Interior Ministry says they have no data on other active police officers being part of the security guards employed by the company. According to the rules of the Panamanian Maritime Administration, the embarking of private guards on a ship under a Panamanian must be agreed with the owner and the security company must be entered in a special register. This, of course, had not been done, and the gang the readers see on the pictures had hijacked the ship in a purely pirate attack. As shown by satellite data, published by the site Maritime.bg, on January 14, the tanker BADR weighed anchor and sailed in the direction of Odessa. After four hours of sailing northeast, it made a U-turn and on the morning of January 15 was already anchored in the Burgas harbor. At the joint press conference given by Maritime Administration Director Zhivko Petrov and the Director of the Border Police in the Black Sea city of Burgas, this fact was hushed. In a conversation with Bivol, however, Zhivko Petrov admitted that the Captain of the tanker had not obeyed his order to return to the Bulgarian harbor and had attempted to escape. The incident had played like in an action movie. The tanker had turned off his beacon and radar system, but the border police cutter had managed to catch up with it and bring it back. According to Zhivko Petrov, the Libyan Captain had claimed that he had received an order to flee to Odessa by the alleged owner – Bulgargeomin DZZD. BADR/BDIN, however, had been lacking for months already the necessary certificates to sail anywhere, and apart from that Panama has suspended its temporary registration and is in the process of withdrawing its flag due to the fact that Bulgargeomin DZZD had presented fake certificates to obtain the temporary registration. This makes the ship entirely illegal. Bivol learned that the Ukrainian Captain, hired by Bulgargeomin DZZD, is Sergei Mirgorodskiy. Colleagues of Bivol from Ukraine managed to find his phone number and to reach him. He initially confirmed that he was aboard BADR, but then again, during the next call already claimed that he was not on the tanker but in Odessa.